Inflation rose to a 14-month high of 7.52% in November as food items, especially potato and onion, became costlier, strengthening the case for the RBI to hike the key interest rate by another 0.25% for the third time in a row at its policy review later this week. With the growing number of Indians looking to go abroad, India has emerged as a global leader in inward remittances. Sudhesh Giriyan discusses the present scenario and future of remittances to India. The Telecom Regulatory Authority of India (TRAI) has sought a clarification from the Department of Telecommunication if it has to again recommend the pricing for the CDMA-based spectrum. Inflation as measured by the wholesale price index (WPI) is at the highest level since 8.1% in September 2012 and 7% in October. Vegetable prices shot up 95.25% in November compared with a 78.38% increase in the previous month, government data showed. Inflation in the food segment comprising wheat, pulses, vegetables and milk, among others, was at an almost four-year high of 19.93%. It was at 18.19% in October. 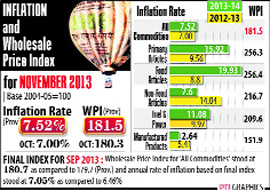 WPI inflation for September was revised upwards to 7.05% from the earlier estimate of 6.46%. Last week, the government said retail inflation, measured by the consumer price index, jumped to 11.24%. The RBI is expected to take into account rising inflation and declining industrial output data in its mid-quarterly monetary policy review on Wednesday. "We expect the RBI to raise the repo rate by 0.25% to guard against a further hardening of inflationary expectations and generalisation of food inflation," ICRA senior economist Aditi Nayar said. Factory output contracted 1.8% in October, as against growth of 8.4% in the same month last year. "We hope RBI will take due cognisance of the fact that growth is still feeble and needs support," industry chamber Ficci said. As per the data, potato prices shot up by 26.71% in November compared with a contraction in the previous month. Onions, too, were costly, although the price rise eased from October. Onion inflation was at 190.34% in November. The data showed protein-rich items such as eggs, meat and fish were costlier by 15.19%, while milk was dearer by 6.25%. Food inflation is likely to ease to some extent as vegetable prices moderate, according to Angel Broking economist Bhupali Gursale. "In light of the RBI's hawkish stance on inflation and continued focus on anchoring inflationary pressures, we continue to expect the RBI to hike the repo rate by 0.25%," Gursale said. Q. What is the outlook on inward remittances to India for the year 2013? A. Globally, there is a burgeoning demand for Indian workforce due to intellectual capabilities and effective skill sets. There are approximately 27 million Indians living overseas and this number is growing at a healthy rate. According to World Bank, India received $69 billion in 2012 and it emerged as a global leader in terms of inward remittances. Owing to factors such as rupee depreciation and the growing demand for Indian workforce abroad, India will continue to dominate as the largest remittance recipient in the world and is likely to see an increase of 15% in 2013. Q. What has been the impact of significant depreciation of Indian rupee in the recent past? How have NRIs reacted to this scenario and what has been the impact of rupee depreciation on inbound remittances? A. There has been a significant rise in the remittances to India. Since May 2013, the Indian rupee has depreciated over 12% and has hit an all-time low of 61.80. This scenario is favourable for an NRI as the value of remittances appreciates. A 10-12% spike in remittances is what we are seeing in the past few weeks since the fall of the rupee started. Q. Will mobile technology be a significant game changer in the remittance sector? A. Yes, mobile remittance is something which is gaining momentum in various parts of the world and there is a huge potential for it in India as well. The mobile penetration in India is very high and should the regulator decide to open mobile remittances for international transfers to IMTOs such as us, it will help in making remittances very convenient. It will also help in financial inclusion of the un-banked population to a large extent; people might not have a bank account, but people in all corners of India today carry a cellphone. So yes, we see a huge potential in this sector; we currently offer mobile remittances in countries such as the Philippines, so we have the capabilities to offer it in India as well, once international transfers are allowed in India. At present, only domestic money transfers can be done via mobile phone. Q. India is the largest receiver of remittances. Will the recent rupee slide attract more remittances for the year 2013 and will it widen gap between India and China? A. With the rupee continuing to weaken, NRIs will receive better value for every dollar they send back home. So even if the regular remittance amount does not change drastically, the value of what is being received in India will be higher. As a trend, NRIs keep a watch on the prevailing currency rates; while the blue collared Indian migrants might not be able to change their remittance amount, the white collared Indians working abroad will surely increase the ticket size of what they are sending back home. Going by this trend, there is a high possibility that the gap between India and China will widen further because of the fall in the rupee. Q. At present, southern states such as Tamil Nadu and Kerala etc. are the largest receivers of inward remittances in India. Five years down the line, do you think states like Bihar and Uttar Pradesh can acquire this position? A. In India, Kerala, Tamil Nadu, Punjab and Andhra Pradesh have been the major remittance receiving markets traditionally. However, in the recent past, we have seen high potential markets such as Uttar Pradesh, Karnataka, Rajasthan and Bihar coming up in a big way in terms of remittances. Uttar Pradesh has made its way to the top 5 remittance receiving pockets in the country. Xpress Money being a global money transfer brand, we definitely foresee these other markets as strong contenders for the top remittance receiving markets in India. Q. 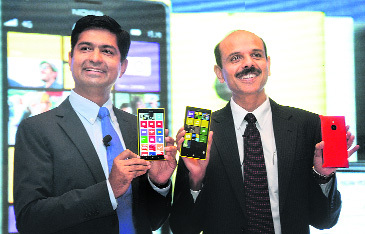 What are Xpress Money's plans for India and which are the key growth markets? A. At Xpress Money, our focus is to make our services available to a wider range of Indian consumers and hence we are expanding aggressively across the country. Today, our network stands at over 45,000 agent locations across India. We want our brand to be available even in the remotest of areas in India for the convenience of our beneficiary customers to receive money sent to them by their family members abroad. Having earlier recommended “no auction” for the 800 MHz spectrum, as there had been no takers for it in the previous auction, the TRAI has written to the DoT seeking to know whether the EGoM had given directions for seeking of new pricing for the CDMA spectrum from the regulator.